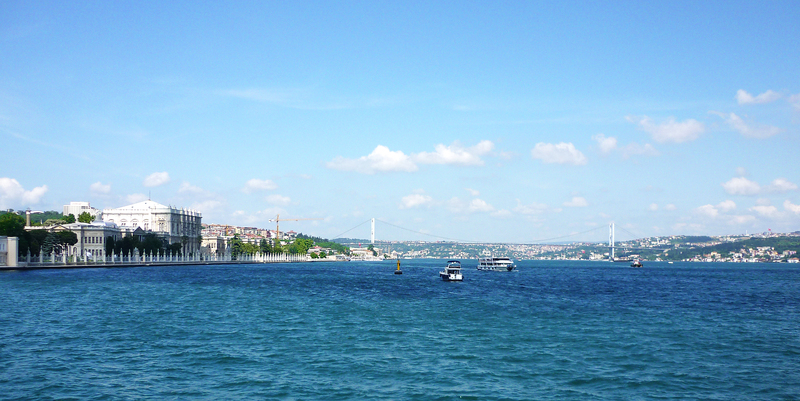 My photo this week is of the Bosphorus. Between Asia and Europe, the twenty mile stretch of water links the Sea of Marmara with the Black Sea, at Istanbul. It’s a lovely place for an afternoon or evening cruise with drinks, nibbles or dinner. On both sides the architecture is outstanding, palaces, hotels, colleges and homes of the Istanbullu glitterati. Europe is to the left and Asia to the right. Wow! This is a really amazing photograph! Thanks for sharing! Not so farway from me, but still haven’t been there, beautiful picture! a wonderful image – and am remembering travelling between Europe and Asia as well….. Turkey is such a fascinating place to visit. That’s the palace of the attaturk! it’s lovely. he has a bathroom with the most amazing view! for sure one of Europe’s most famous landmarks! Perfect for the theme of between. Oh those blue expanses. Lovely. Been there, a great place 🙂 I wish 2012 offers you and your family health, peace and love. They will add the strength and harmony we all need. Wow , how great the “Between” is! I’m sure a lot of romance were inspired from this spellbinding place. What an amazing view of the blue sea……Happy holidays. Absolutely outstanding …. great challenge entry. I love the way the two colors of the sea are sooo visible. A fascinating photo with a little history added. Very nice, Gilly. P.S. Yesterday .. Christmas day …. I took a photo of your card on my wall. I will try to post it. I think of you each time I see it. Thank you again. Pingback: Weekly Photo Challenge: Between | Thinking aloud…. Wonderful shades of blue, and a very good photo for the challenge! Happy Holidays!